At the end of September, I embarked on a journey that not many little girls imagine they’ll ever get to go on. I woke up early, took an Uber to Logan airport, and set off on a trip to the great city of Ann Arbor, home of Domino’s World Resource Center! As you can see, I was psyched to be visiting as a Domino’s Digital Insider. During the first day, we did lots of fun things, but my favorite by far was getting to make our own pizza in a replica Domino’s kitchen. Above, you’ll see me getting a little help stretching out my dough. Unlike my usual routine of winging it & hoping the shape fits on my pizza stone, there is a method to how Domino’s makes their pizzas. After you stretch out the dough, you add sauce with a specially designed ladle and throw your pizza on a scale. There is a guideline to how many ounces of cheese you should add on – rest assured, I more than doubled that amount because I was so excited I forgot to keep track. The more the merrier, right? I threw some pepperoni on because that’s my go-to pizza order, and into the oven it went. BOOM, I MADE MY OWN DOMINO’S PIZZA AND GOT TO EAT IT FOR LUNCH! We also went on a tour of basically the entire building – from the IT department (their largest,) to the social media handling center (they get alerts if any big shots tweet at them,) to the Domino’s test kitchen pictured above. This is where pizzas are actually tested out, and commercials are filmed. Unfortunately, I was not asked to bust out my acting chops. Our group of Domino’s Digital Insiders were invited because we are decent at social media, and not surprisingly, I loved those aspects of the presentations we saw. 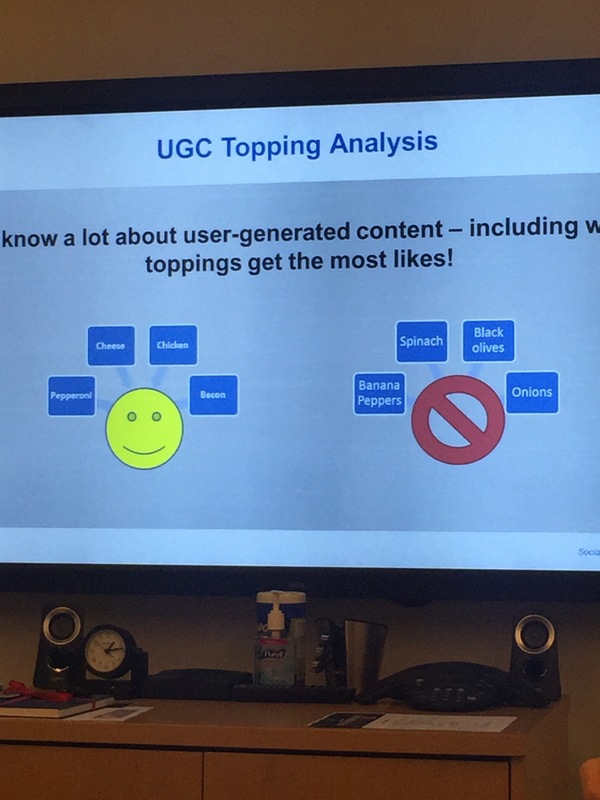 With my main platform being instagram, which is largely visual, this slide on the most popular toppings resonated with me. The more cheese & pepperoni on a pizza I post, the more likes. Green things? Usually not as bueno. The Domino’s instagram account might be a lot more popular than mine, but we’ve got the same struggles. On the sentimental side of things, we also learned about Domino’s work with St. Jude’s, which definitely made me cry. Go ahead and donate the extra dollar at checkout. We were visited by a Domino’s franchisee whose love for pizza and serving it to people definitely warmed my heart- anyone who turns pizza into a career is an absolute winner and living the dream as far as I’m concerned. We also had a sit down and Q&A session with a few guys who are kind of a big deal in the company – Tim McIntyre, the EVP of Communications, Legislative Affairs and Investor Relations, Patrick Doyle, the CEO, and Kevin Vasconi, Vice President, Global Infrastructure and Enterprise Systems. When I asked Patrick about his successes and failures, he was quick to respond that he considered the brand relaunch to be his greatest success. As far as telling us about a failure, Tim jumped in to tell us a story about one of Patrick’s first big marketing projects that went awry. Let’s just say it was an oversight that had some serious Michael Scott “Golden Ticket Promotion” vibes, and would have been caught much quicker in today’s world of social media. Pictured here is the Domino’s DXP delivery vehicle, which is totally tricked out so that it is the best possible pizza delivering machine. It’s got a warming oven, cupholders for dipping sauces, and each one even has its own name. There’s only room for one person so that there is maximum room for pizzas. Driving solo dolo isn’t a bad thing when you’re riding with 80 pizzas. Of course, we’re all more familiar with their technological advances when it comes to ways to order pizzas. I personally like using their website, but as it turns out, once your Easy Order is set up, you can order using Twitter, Facebook Messenger, yelling at your Alexa, or even just by opening an app. Domino’s Anyware is really hooking it up for those of us who dread having to make a call and talk to a person to order food. For our last lunch, we ate international Domino’s pizzas that were recreated based on what popular toppings are all over the world. However, in true Pizza Blonde fashion, that’s a post for another day!